Her particular areas of influence include watching over sheep and flocks and all stages of the processing of wool - from fleece to yarn to handknit item which makes her particularly relevant to us knitters. Makosh’s iconography is ancient, simple and powerful. 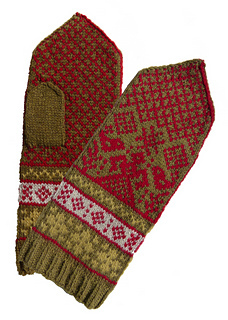 Moreover, as a deity deeply connected to knitwear her symbols are ever-present in the traditional colourwork motifs of many Slavic knitting traditions - once you know what to look for you’ll be amazed at how pervasive her imagery is! She really is ever-present in the wool we use and the knitwear we make! 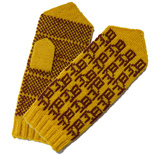 These mittens combine some of those very subtle motifs with a traditional representation of Makosh herself flanked by vegetation and birds who act as physical representations of her bounty. 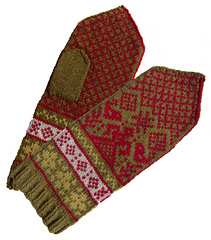 Old, folky colours add additional symbolism and Eastern European charm.